Disclosure: This post contains affiliate links. I may be compensated for your purchases made via these links; thank you for your support of my blog. I talked earlier this afternoon on Facebook Live about my goals for 2017, and one of those goals is about to lose about 40 pounds. I have joined Weight Watchers as a tool to help me with this, but there are many other day-to-day healthy choices that I plan to make in order to establish new habits. I think sometimes we put off making healthier choices in our day-to-day lives because we get overwhelmed with how many changes we want to make. And sometimes, we put off leading a healthier lifestyle because we think that we need to spend a lot of money on new foods, new exercise equipment, a new gym, a new fitness program or a new training coach. I’m here to tell you that doesn’t have to be the case. You can start making changes today without getting overwhelmed and without spending a lot of money. 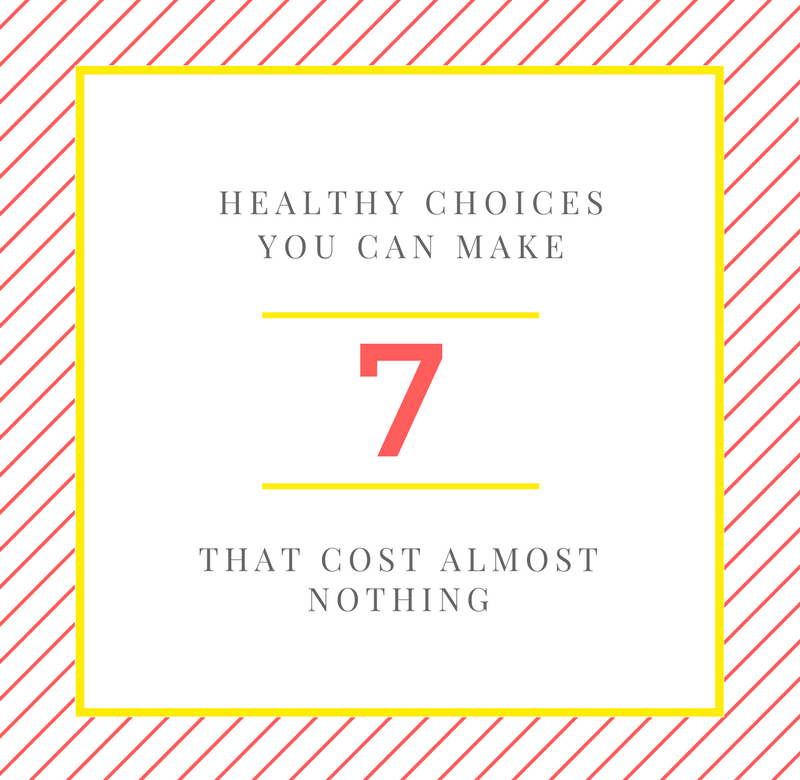 Here are seven healthy choices you can make today without spending a dime. I think that I mention sleep habits almost every time I write about making healthy choices. I think it’s something that we ladies don’t place enough importance on. Seriously, getting enough sleep reduces our stress levels, allows us to think more clearly, and make better choices. Being sleep deprived makes us more likely to crave sugar or sweets, reduces our energy levels, and affects our body’s ability to lose weight. Want to learn some way to improve your sleep quality? Check out my blog post: Why You Need More Sleep & How to Get It. Much like getting enough sleep, staying well hydrated can improve your brain function. In fact, it can help your body compensate when you are sleep deprived. Drinking plenty of fluids also helps flushes our bodies of toxins, helps regulate hunger and improves skin quality. Swapping water for sugary drinks or soda will help with weight loss, which is a great bonus. I also find that there’s a huge difference in my ability to perform and keep myself safe in jujitsu class when I’ve had plenty to drink. I aim for drinking half my body weight in ounces (80 ounces if you weigh 160 pounds), but you should speak with your medical professional about how much water (or other non-caffeinated beverages) will be the right amount of hydration for you. Okay, this is a little geeky, but my dentist will be happy. Seriously, taking care of our teeth and gums can help prevent serious health concerns like heart disease. Having pretty pearly whites is also going to increase your confidence levels, and smiling at someone as you walk down the street is a great way to boost your mood and probably make their day. This goes beyond getting some daily movement in. I mean, going for a 10-minute walk can be a great way to start integrating exercise into your life. Since I am a dedicated Fitbit user, I do advocate setting and tracking a daily step goal. But I also want to advocate the benefits of fresh air and sunshine. Spending some time outside is a great way to let your mind recharge, and sunshine is one of best natural sources of vitamin D. I’m willing to bet if you take a stroll around the block every day for a week, you’ll feel more energized and more at peace. Even if you aren’t regularly exercising. Stretching for a few minutes at the start of each can be beneficial. It will help you maintain your body’s mobility and will help “wake up” your body for the day ahead. If you are regularly exercising, properly stretching can help prevent injury and help increase performance. You can also use stretching as a measure of physical capability; I really surprised myself when working on the 30-day stretch project in 2015. My endurance and flexibility were markedly different from day 1 to day 30. Establishing a meditation practice was something that my massage instructor really emphasized when I took the class. Even just 10 minutes each day will help you bring more focus and clarity to your day. I’ll admit that I don’t meditate daily, but on the days that I do, I find that my mind is calmer, I’m more productive at work, and I feel better overall. And learning to control your breath can help you lower your heart rate when you find yourself in a stressful situation. Taking some time each day to review what we’re thankful for can help reduce stress levels, which definitively has physical and mental health benefits. I believe that have a gratitude practice will improve our relationships with those around us and that focusing on positivity will attract more positivity in our live. This is actually the habit that I’m working on this month. I have a journal where I’m recording 3 things each day that I’m grateful for. Choose any one of these changes to establish a new healthy habit. Focus on it for about 30 days to be sure it’s well-established. Then choose another healthy choice. No money required unless you choose to spend it. Also, sign up for my email list to get more healthy and frugal living tips as well as ideas to feel more balanced in our busy lives. What’s healthy habit will you choose to focus on? What other ways can you make healthy choices that cost nothing?